Taking in three countries, two celebrated European capitals and a string of captivating heritage towns brimming with historic and cultural wonders. Arrive at Munich Airport and transfer to Nuremberg to embark your Emerald Waterways luxury river cruise ship and where you will be welcomed by your Captain and crew. Nuremberg is situated along the Main–Danube canal, an engineering masterpiece linking the rivers of Germany with the mighty Danube which flows from the Alps to the Black Sea. Today, you will have a sightseeing coach tour of the historic city of Nuremberg. Your coach tour would pass by the sights of the 900-year-old ramparts, the Justice Palace where the War Crimes Tribunal sat in 1946, the Nazi party rally grounds, where rallies were held from 1933 until 1938 among other historical sights. Afterwards, take a self-guided tour of the WWII Documentation Centre or instead enjoy free time in the city centre. Welcome to Vienna, the capital of classical music. Today you have a choice of either exploring Austria’s capital beginning with a drive along the magnificent Ringstrasse, where we will see some of Vienna’s world-famous sights such as the Opera House, Burgtheater, Town Hall, St. Stephen’s Cathedral and the Hofburg Imperial Palace. If you feel active, join the guided bike tour instead of the drive around and guided walk. After breakfast, disembark the ship and transfer by coach to the vibrant city of Budapest. Enjoy a guided tour of the city, passing by like the Hungarian Parliament Building, the Buda Castle and the Chain Bridge linking Buda and Pest. Included is a two-night stay in Budapest. Take the day to enjoy this lively and exciting city. After breakfast, it is time to farewell your fellow passengers and transfer to the airport for your onward or homebound flight. 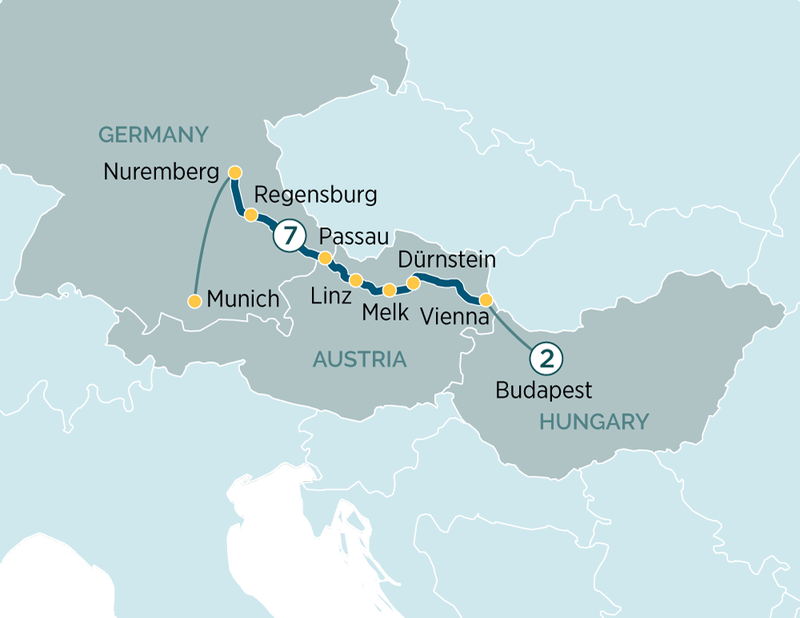 Beginning in the Bavarian city of Nuremberg, this 8-day Classic Danube itinerary offers a trip through Germany's military past, the medieval city of Regensburg and an immersive experience in Austria.